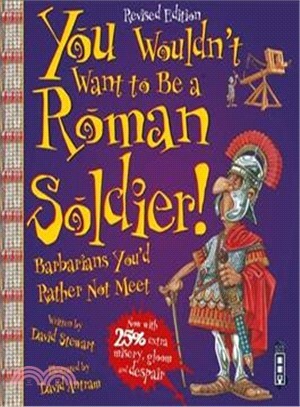 You Wouldn't Want To Be A Roman Soldier! Get ready... as a young man living in the Roman Empire, you’ve heard many stories about far-away lands and people. It sounds exciting but you’re about to discover how tough life really is for a Roman soldier! The humorous cartoon-style illustrations and narrative approach encourage readers to get emotionally involved with the characters, aiding their understanding of what life would have been like. Informative captions, a complete glossary and an index make this title an ideal introduction to the conventions of non-fiction texts for young readers. This work fits into KS2 History and is in ideal text for shared and guided reading for KS2 pupils within the framework of the National Literacy Strategy. It helps achieve the goals of the Scottish Standard Curriculum 5-14.